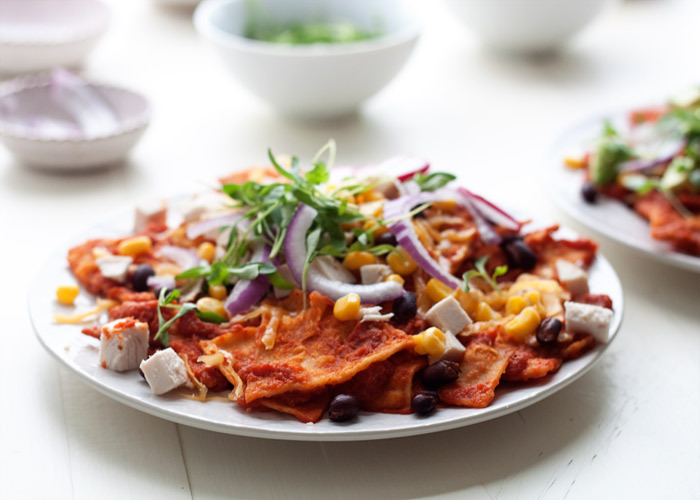 A bit like a cross between enchiladas and nachos, this version of the easy Mexican dish features healthier baked (not fried) corn tortillas bathed in a spicy chipotle-tomato sauce. Then top individual portions to your heart’s delight to make them vegan, vegetarian, or carnivorous! That’s how you pronounce the easiest dinner you’ve made in a long, long time. Well, I guess I’m actually not sure what you’ve been making in your kitchen (how creepy would that be?!) – so I probably should rephrase. What I can say is that these Spicy Chipotle Chilaquiles are definitely the easiest dinner I’ve made in a long, long time! 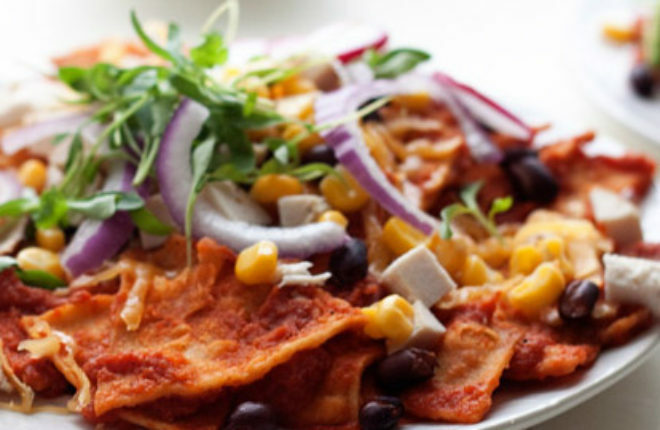 So, first off – do you know what chilaquiles are?! I didn’t. I’m the first to admit I’ve been hearing about them for awhile, but, yep, I really wasn’t sure what they were all about. 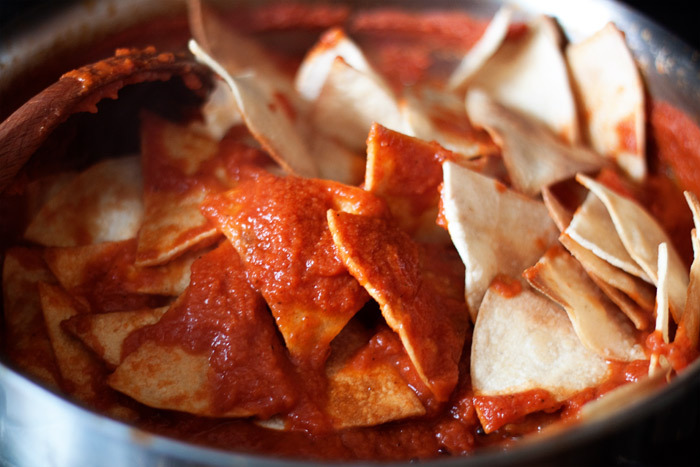 Well, they’re a traditional Mexican dish made with fried tortillas that are simmered in a chile-tomato sauce. 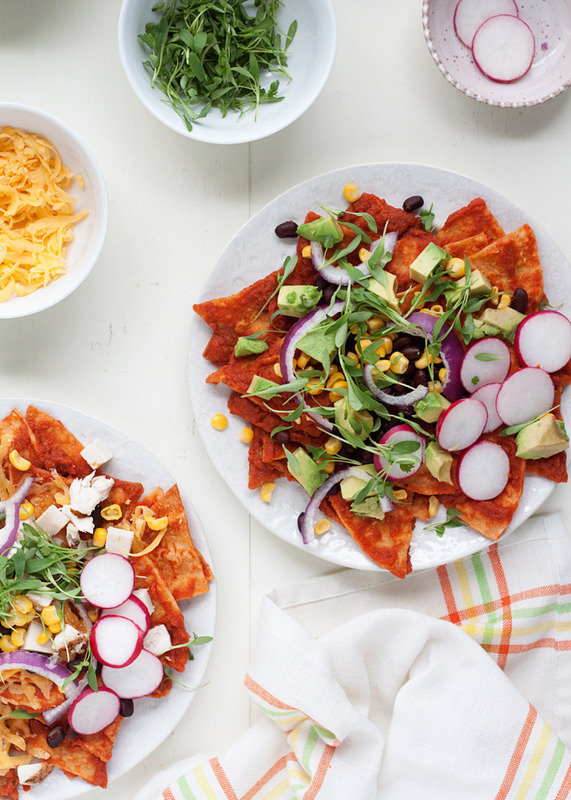 They’re sort of a cross between enchiladas and nachos. And not only are they super simple to make, as it turns out, they’re also incredibly adaptable for multi-vore households. You can make ’em vegan, vegetarian, and/or meaty for the omnivores. 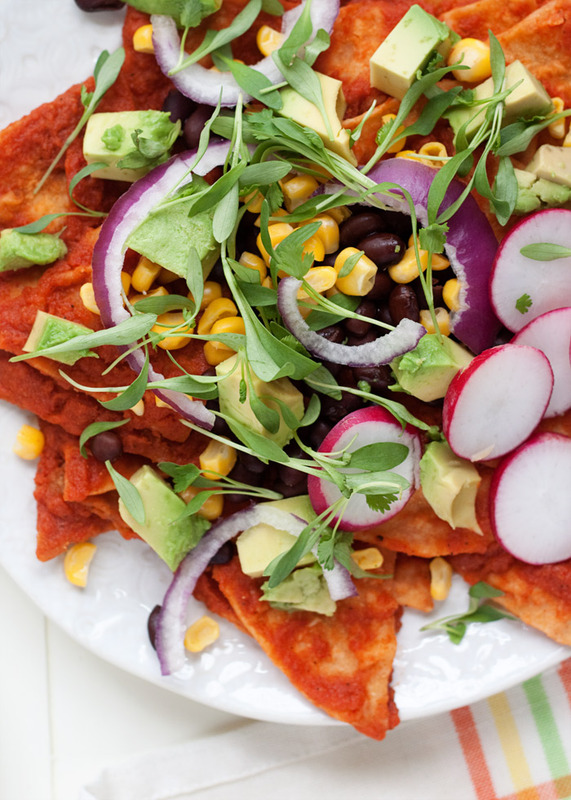 Plus, as long as you choose 100% corn tortillas, they’re already gluten-free! 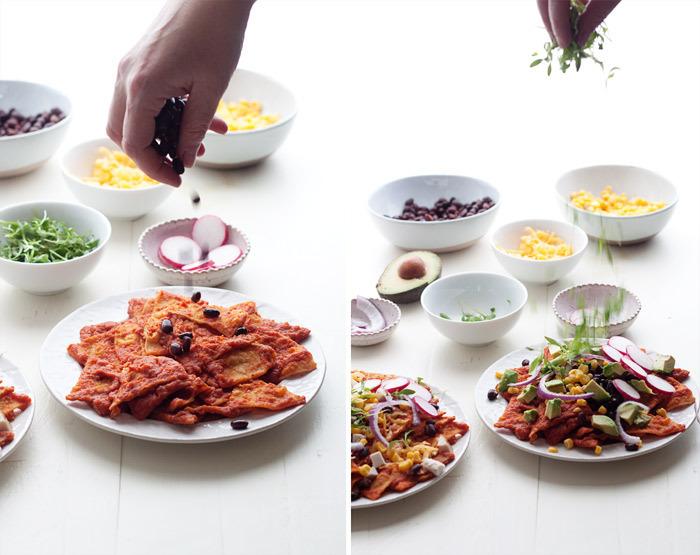 Here’s how I make Spicy Chipotle Chilaquiles (3 ways)! 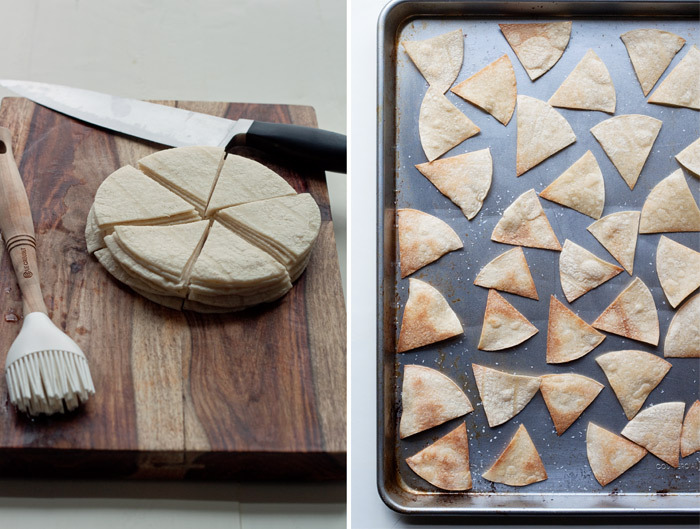 I brush corn tortillas with olive oil, cut them into wedges, and bake them until crisp. Meanwhile, the sauce simmers. In order to keep these on the healthier side, I cut fresh corn tortillas into wedges, brush them with a little olive oil, then bake them until crisp. 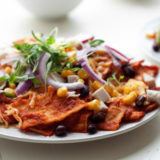 The tomato sauce is ready just about the time the chips are – just stir them in and the base of your chilaquiles is done! 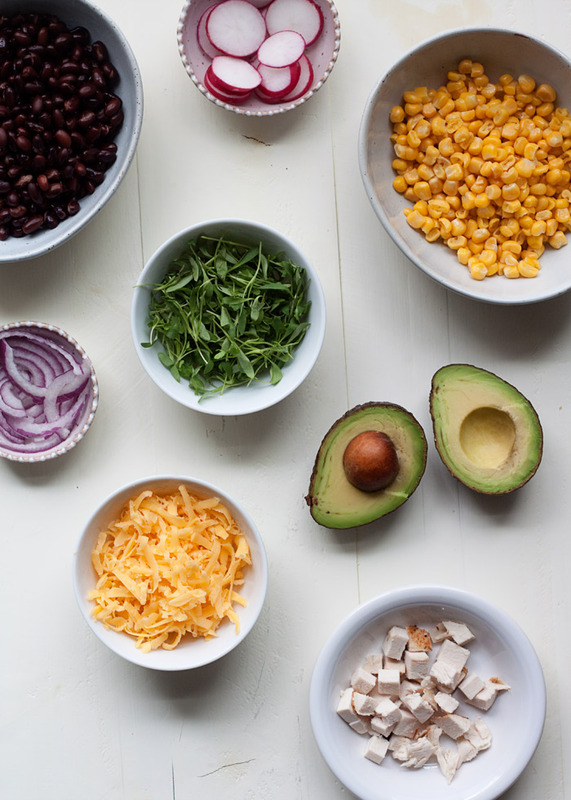 Now it’s all about the toppings – avocado, sliced radishes, onions, fresh cilantro, maybe a smattering of warmed black beans for the vegans. Maybe an egg and a sprinkle of cojita or cheddar cheese for the vegetarians. And perhaps some shredded or cubed chicken for the omnivores. Mix and match however you like and dinner is served quicker than you can say chee-la-KEE-lehs! Preheat oven to 400 degrees Fahrenheit. Brush tortillas on one side with olive oil, then stack them. Cut the stack into 6 or 8 wedges (your preference). Lay in a single layer on two large baking sheets and sprinkle with a little kosher salt. Bake until crisp, turning them over about 3/4 of the way through the cooking time, 8-10 minutes. Remove from oven and set aside. Meanwhile, make the sauce. Place tomatoes, onion, garlic, chipotle pepper, adobo sauce, smoked paprika, 1/4 teaspoon kosher salt, and 1/8 teaspoon freshly ground black pepper in the pitcher of a blender. Puree until smooth. Set a large skillet over medium heat. Add the 1 tablespoon olive oil. When hot, pour in the sauce and stir. Cook, stirring occasionally, until bubbling and darker, about 10 minutes. Reduce heat to a simmer and cook, stirring occasionally, until the sauce coats the front and back of the spoon, about 10 minutes more. 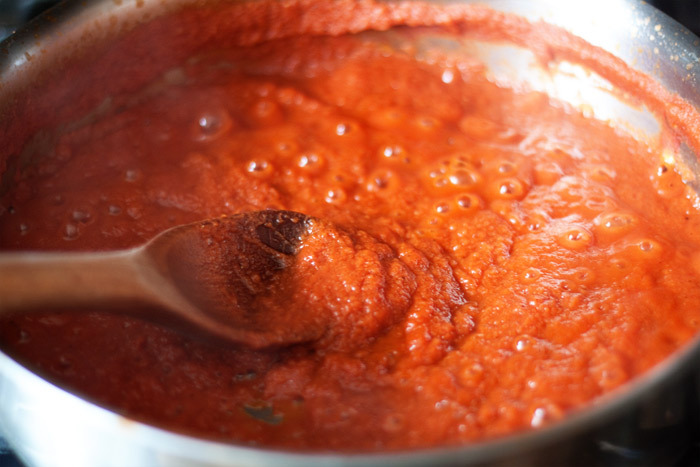 If the sauce seems too thick (it should be about the consistency of canned tomato sauce), add a splash of water or vegetable broth until it reaches the right consistency. Stir in the tortillas. Taste and add additional salt and pepper if desired. Spoon onto plates and top with assorted toppings to customize them however you like! Please make sure your corn tortillas are 100% gluten-free.